Knauf Airless Finish, part of the Knauf Readymixed Finishes range (RMF) was specified on a project led by construction giant Interserve to build a new care centre for Macmillan Cancer Support and South Tees Hospital NHS Foundation Trust in Northallerton, Yorkshire. 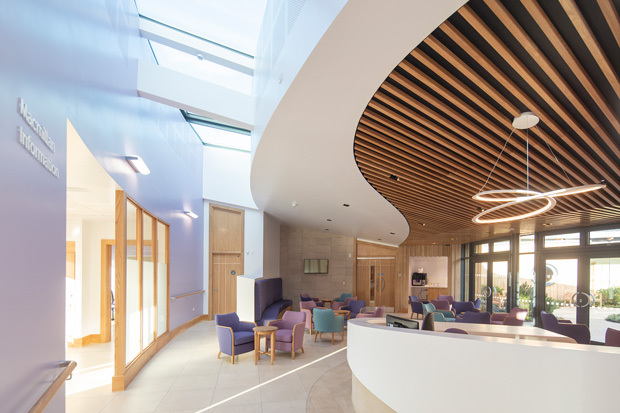 For such a well-known client, it was important to design the building with the end user in mind – in this case it would have to be somewhere that would feel calming for visitors experiencing an incredibly challenging time in their lives. 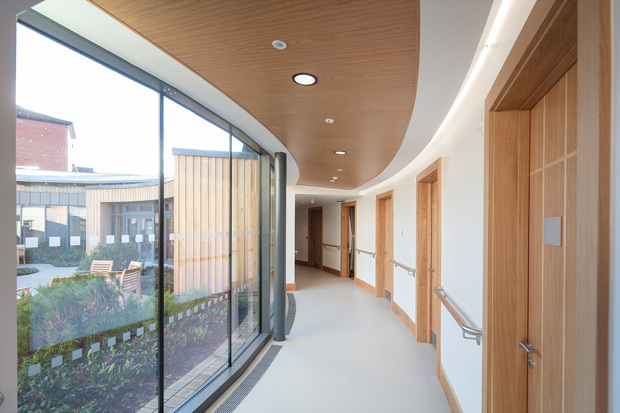 Knauf Airless Finish was used throughout the building in an area covering more than 7000m2. Site Manager/Owner John Graham at Dual interiors Ltd said: “It provides better quality by a mile and it’s saved us a lot of time when it comes to snagging issues. After mist coating, this product produces a snag free quality finish first time. “Additional savings can be achieved as the need for both a mist coat and a first coat finish is eliminated. The product performs especially well with high specification paints such as vinyl silks as there is no flash through of joints on finished walls even where there is large areas of glazing on very light sunny days. “The product is highly sustainable as it requires no water. It does not cause over-spray unlike traditional spray plaster products – in all it is a very clean and easy product to use. The Knauf RMF range, which includes Knauf Airless Finish, has been specifically developed by Knauf’s Research and Development team who actively searched for an innovative way to improve the working conditions of plasterers using their products. Created with plasterers in mind, it is designed to take the hassle out of plastering and is ideal for improving efficiency on larger projects. The productivity benefits of spray-applied plaster are most prevalent where there is a lot of repetitive plasterwork required. For every 27 minutes of work, contractors are getting an extra 100m2 of productivity. The product is supplied on-site as a pre-mixed liquid product, free from dust and ready to be used straight away. The liquid form eliminates the need for a direct water supply on site and reduces product waste as any unused product can simply be recycled back in to the hopper. Unlike other products, Knauf Airless Finish has a drying time of 24-48 hours and requires only little heat and ventilation. Traditional plaster methods tend to require all the moisture to be drawn out first before paint can be applied, which can take up to two weeks. Knauf Airless Finish is applied using a spray plaster machine and hopper. 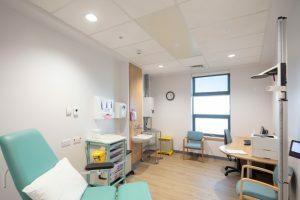 At the Sir Robert Ogden Cancer Centre in Northallerton, Dual Interiors Ltd used a machine loaned from Knauf’s distributor Nevill Long however they are looking to procure a machine themselves for the next time they use Knauf AirlessFinish. 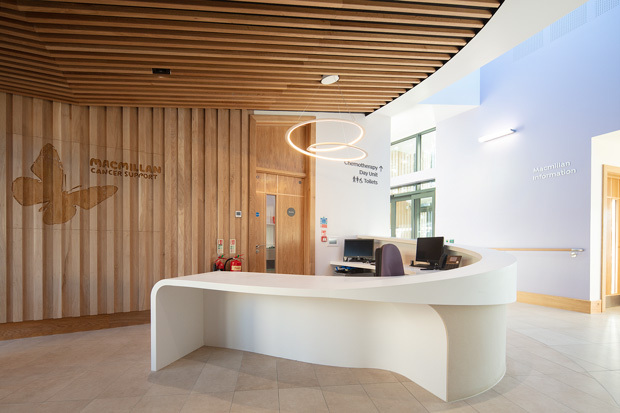 The new facility was officially opened in December 2018 by Sir Robert Ogden, a local philanthropist and Lady Halifax, president of Macmillan Cancer Support. To discover more inspirational projects with Knauf products and systems, please visit our new project showcase at www.knauf.co.uk. The post Knauf Airless Finish wows at new Sir Robert Ogden Cancer Centre appeared first on FMJ.